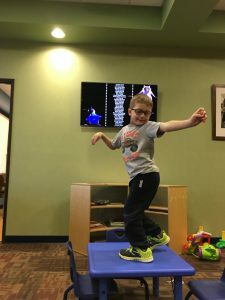 Therapy, CP Clinic, and a New Leg Brace - Adventures with the Tuleys! The past two weeks have been very busy with appointments! 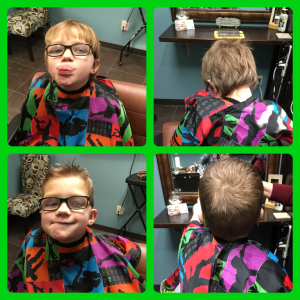 Josiah even got a much needed haircut! I had to snap a picture before telling him he shouldn’t dance on the table! Josiah also had a CP clinic visit. He saw therapists, a nutritionist, pediatrician, an orthopedic surgeon, and his regular rehab doctor. Since we had just been seen for therapy evaluations, those were quick visits. The speech therapist gave some recommendations for trying new foods, which Josiah is excited about. 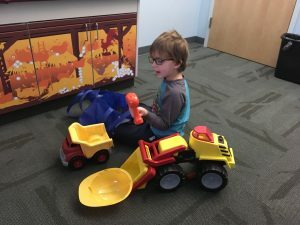 The pediatrician is going to refer him for another neuro-psych evaluation in order to continue monitoring his progress and be proactive in finding any learning difficulties he may have. He had his first neuro-psych exam in the summer of 2016, which is when he started speech-language therapy. He’s had significant progress academically since that time. The rehab doctor is pleased with his progress. He has obvious tightness at his right elbow and wrist, as well as persistent tightness in his right leg. Since he is doing intensive this month, we are planning to do botox in April. At that time he will have botox in the elbow, and we will leave the wrist and hand muscles alone. 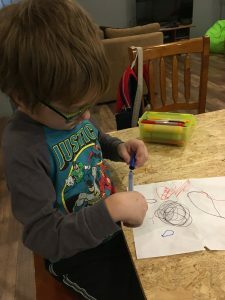 He’s been using his right hand often to do some two-handed tasks, such as taking lids off of markers and putting them back on. He tends to lose this skill with botox because his hand becomes so relaxed, he almost ignores it. It seems to be a fine balance. He’ll also probably get more botox in his right leg. Josiah also picked up his new leg brace. He chose superheroes this time and is super excited about it. We went and picked out some shoes to go with it, and he loves the neon green he picked out. They aren’t velcro shoes, which means he’s not able to put them on/off by himself, so he’s now interested in learning how to tie his shoes only using one hand. I’m not real sure how we’ll accomplish this, because I wasn’t even the one to teach the other three kiddos how to tie their shoes! Picking out shoes was interesting this time. I knew we needed to buy two pair of shoes because he needed two different sizes. 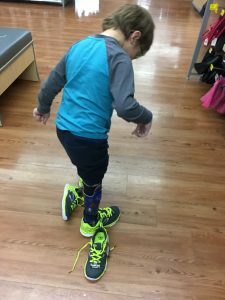 He has the same insert in his left shoe (size 1), but because the new brace is larger, he needs a bigger size for his right foot (size 2). It wasn’t a complete waste though, because he’s been wearing his old brace (size 1) in order to get used to his new one. Even better, the shoes were on clearance and I got them for $7 a pair! Since the shoes were connected together, it was funny to see him walking with the opposite pair dragging behind him. Intensive therapy started last week and he’s loving most of it. 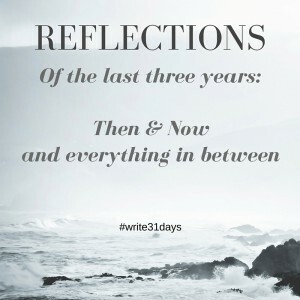 I’ll share more about that in another post soon!